AESTHETIC EYES ARE CHARACTERISED by several features including but not limited to the following: large size; well volumised upper eyelids with smooth contours and a convexity at the eyelid/ brow junction; flat brows at or just above the rim in men and about a centimetre above the rim in women as well as a slight lateral elevation and peaking at the inner two-thirds and outer one-third junction in women; the brow fat pads should be full, at or just above the rim; the lower eyelids should have a short vertical height blending smoothly with the upper cheek without depressions, hollows, or irregular/pronounced fat herniation. Skin pigmentation should be even and periocular symmetry is critical. Mendelson has described an ideal lower eyelid as showing a transition from a lid concavity to a cheek convexity occurring high over the lid fat, not lower at the orbital rim1. Hyaluronic acid fillers (HAF) are a great non-surgical option that may be safely injected to rejuvenate the periorbital areas. They can be used to correct upper eyelid sulcus and A-frame deformities. HAF can Improve inferior orbital hollows, tear trough deformities, palpebromalar/mid-cheek grooves, and mask lower eyelid fat herniation. 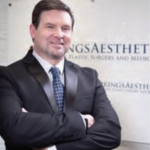 In my practice HAF sometimes supplant surgery, enhance postsurgical results, and have helped unhappy referred post surgical patients suffering from infraorbital hollowing from excessive fat removal. In the lower eyelids, dermal fillers provide an ability to smooth the eyelid-cheek convex continuum in a manner that surgery sometimes cannot. I have coined this a ‘filler blepharoplasty’ as it is truly a reshaping of the tissues. 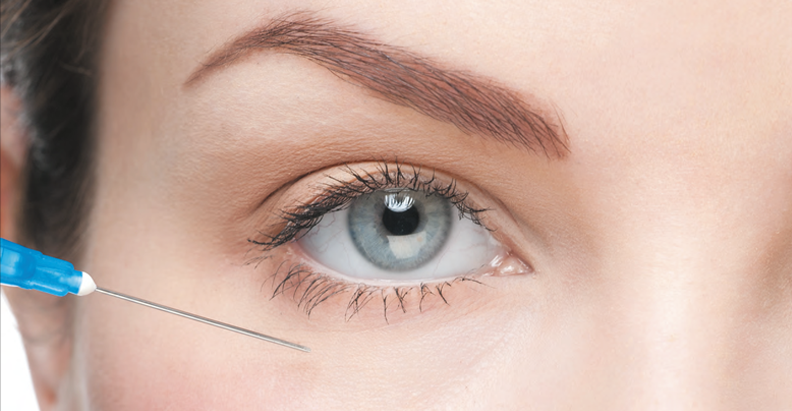 Lower eyelid dermal filler injections usually last between 1–3 years. HAF also provide nice lateral brow volumisation, contouring, and lifting. Midface enhancement beautifies cheek fullness, nasolabial folds, infraorbital hollows, and shorten age-lengthened lower eyelids2–5. Eyelid retraction and any excessive white scleral show can be improved by injection of HAF. An advantage over autologous fat grafting or implants is that the results can be fine-tuned or completely reversed with hyaluronidase enzyme (HAE). Studies have shown that HAF have variable resistance to enzyme dissolution with the Juvederm Vycross (e.g., Voluma, Allergan, USA) fillers more resilient than Juvederm Hylacross (eg., Juvederm Ultra, Allergan USA)/ Cohesive Polydensified Matrix (CPM, Belotero Balance Merz, USA) and the Restylane Non-Animal Stabilized Hyaluronic Acid (NASHA, Galderma, USA) family of fillers as most dissolvable6–8. Periocular hyaluronic acid injection contraindications Certain patients should not receive filler injections into the eyelids to include but not limited to: unrealistic expectations; pre-existent lower eyelid oedema; propensity to eyelid or malar oedema/festoons; and those with extremely thin skin. If laser or radiofrequency treatments are also planned, then I recommend waiting a month after the injections or after the resurfacing to avoid altering or displacing the filler. We advise patients to stop any non-essential blood thinning vitamins, medications, alcohol consumption, or supplements a week before injections. However, I have injected patients on prescribed blood thinners, who are contraindicated for surgery but can be safely injected especially if a cannula is used with HAF. Know your local ophthalmologists in the rare event of acute vision loss. Some lower eyelids can be improved with a series of small aliquots along the anterior maxilla. A cannula can be used for this technique, but if a needle is used then I think it is safest to insert the needle vertically down to the periosteum then without moving inject slowly. It is best to avoid known neurovascular foramina, such as the infraorbital and the zygomatico-facial with either a needle or cannula. Unfortunately, intravascular injection anywhere in the face can lead to visual complications because of the abundant vascular interconnectedness. Other known danger zones are the angular, facial, labial, temporal, supraorbital, and supratrochlear vessels. If needles are used then it is essential they are placed on a Luer-lock syringe securely as there have been needle expulsion globe injuries and vision loss when non-Luer lock syringes were used13. Intravascular injection complications have been reported for all fillers and autologous fat and carry the risk of blindness, which all patients should be informed of and thorough informed consent obtained. Filler, however, may be safely and comfortably injected into the periorbital areas using a cannula technique. Filler injections around the eyes with needles or cannulas are off-label and patients should be informed. I switched to using a 22G x 2-inch cannula (SoftFil, France, DermaSculpt, France) for the vast majority of my periorbital injections several years ago as the large size reduces the risk of intravascular injection with high patient satisfaction and more comfort compared to needles being used close to the eyes. Needles and smaller cannulas (25G or higher) act more like a needle and can more easily penetrate into vessels and therefore carry a higher potential risk9–10. 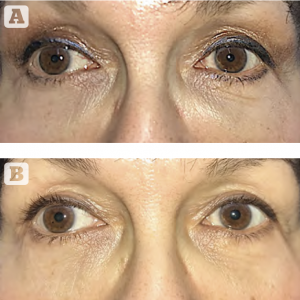 Figure 3 (A) Over-filled bluish discoloration following Belotero Balance injection, (B) after injection of 30 units of Hyaluronidase to sculpt the filler resulting in improvement. Another advantage with thicker 22G cannulas is they pass into and through the skin much easier than thinner calibre cannulas, and I have found them helpful in some circumstances for releasing the orbicularis retaining ligament or subdermal adhesions such as the deeply grooved areas of the glabella. The 2-inch cannulas are also sufficiently long to treat the entire lower eyelid and much of the midface from a single injection point at the lateral zygoma area 2–3 cm below the lateral canthus in line with the lateral corneal limbus. With my background as an ophthalmologist, there is very little that gives me concern procedurally or surgically around the eyes, but blindly injecting substances that can cause blindness through a needle or finer cannula certainly does. Even knowing the detailed vascular anatomy as an oculofacial plastic surgeon, I believe injections are safer with a large 22G cannula as compared to needles though I ‘fine-tune’ the results with a needle as needed. There are many vascular variations in the periorbital areas with many having a direct connection to the intraorbital vessels feeding the ocular vascular supply. Once there is an embolic vascular occlusion of the retina there will be irreversible vision loss if it is not restored within about 90 minutes. I always keep plenty of vials of hyaluronidase in my office (at least 600 units) in the unfortunate event of a vascular complication, and my staff are trained to take all phone inquiries following dermal filler injections seriously for unusual complaints of bruising, skin discolouration, discomfort, or visual changes following injections so patients may be brought in for urgent evaluation. Belotero balance with its cohesive polyphasic design and low G-prime is ideal in the lower eyelids because it very rarely causes the blue-gray dyschromia (‘Tyndall Effect’) that is more commonly seen with NASHA, Vycross, and Hylacross Fillers11. NASHA (Restylane-L, Galderma) and CPM (Belotero-Balance) fillers have low to moderate hydrophilicity, respectively, compared to Hylacross fillers (e.g., Juvederm Ultra) reducing the chance of an edematous ‘puffy’ look12. Vycross fillers (e.g, Juvederm Volbella, Voluma; Allergan) are also less hydrophilic, but are more resistant to enzymatic removal with HAE especially compared to NASHA or to a lesser degree CPM. 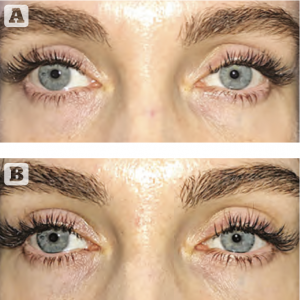 In my experience, Restylane-L is a fantastic lower eyelid filler for thicker-darker skinned patients, as the risk of blue-gray dyschromia is lower especially when placed deep below the orbicularis and along the bone because of its low water absorption12. In very thin skin patients, I prefer CPM Belotero-Balance because, of its lower blue— gray dyschromia risk. I advise less experienced eyelid injectors to start with CPM filler because it has been the most forgiving hyaluronic acid filler in my experience for this area. When a patient is ready for a repeat injection, I often offer Restylane-L at this point as it can last longer and withstands displacement and flattening much better than CPM. I have experience with Restylane Silk and Refyne in the eyelids, but generally stick with Restylane-L as Silk, in my opinion, can be more hygroscopic, and the flexibility benefits of Refyne are not needed in the lower eyelids. For extremely thin-skinned patients, I still recommend they remain with CPM and have seen it last up to two years. Most patients only require a single syringe (approximately 0.5 cc per side) while others only 0.2–0.3 cc per side. Many will not need more than 0.2–0.3 cc per side. It is best to have patients upright to address the periorbital concerns in the same position as seen by others. I often fill to the desired effect on one side and have them confirm with a hand mirror that they are pleased before moving to the other side. If there is any filler remaining in the syringe following the patient’s satisfied inspection, I then usually place some into the lateral brow tissues to ideally volumise brow fat pad fullness and provide optimal brow contouring and lift. It is important, especially in younger patients, to warn them that they may feel a ‘pop’ as the cannula crosses through the tear trough or orbicularis retaining ligaments to avoid a startle response. If there are significant tear trough and lateral palpebromalar depressions, then direct preperiosteal injections is typically necessary. We use ‘distraction’ anaesthesia by tapping another body part or providing a vibrating device during the injections, but with the cannula it is usually quite comfortable. For very anxious patients we have prescribed 1 mg Lorazepam and also have inhalable nitrous oxide available (Pro-Nox by Carestream, USA). Rarely topical lidocaine-tetracaine anaesthetic is applied ahead of time, but I never inject local anaesthetic around the eyes for HAF injections as it can distort the anatomy. If an area is overfilled or some other contour irregularity is noted, then a cotton-tip applicator is used to massage and smooth the area immediately upon injection. Advise patients not to rub the areas with pressure as it is such a smooth filler that it can be flattened or displaced losing the beneficial aesthetic effect. We also counsel against rubbing the area, in an area of perceived over-filling, for several days as sometimes it is just temporary swelling. Cold compresses can be helpful, and if bruising does occur we have found intense-pulsed light treatments to speed resolution. Injecting the glabella with filler can be very risky, carrying both local and distant vascular compromise complications. Therefore, before injecting HAF into the glabella folds I require patients to try wrinkle blocking first with a botulinum toxin both optimally dosed and placed. If the results remain unsatisfactory, skin resurfacing can be helpful. When I do inject the deep glabella fold areas with HAF, I always use a 22 G cannula from an injection site superiorly on the forehead and often move the cannula under the folds longitudinally (in parallel) multiple times to loosen the deep dermal attachments with a subcision type technique to create a space for the filler to go otherwise it can just displace laterally to the folds worsening their appearance. I always compress the supratrochlear and supraorbital vessels at the orbital rim on the side being injected to collapse these vessels and lessen intravascular injection risk. It is essential to inject slowly and if any evidence of vascular compromise occurs stop immediately, massage the area, and inject high volume hyaluronidase. I think needle injections and small-calibre sized cannulas in the glabella should be contraindicated for deep glabella injections. I advise against permanent fillers or hydroxylapatite (Radiesse, Merz) since they cannot be reversed with hyaluronidase in the event of local vascular occlusion. For superficial glabella line filling, Restylane Silk or Belotero Balance with a serial intradermal puncture technique directly in the lines staying superficial to the underlying vessels can be safe and helpful. HAF for the crow’s feet can be performed for moderate improvement. Generally, however, much better results are achieved with botulinum injections or skin resurfacing. Under-eye improvement of lid rhytids is often gained by filling the tear trough and the palpebromalar depression without direct injection. For the crow’s feet areas, I do superficial serial puncture with very tiny amounts of either Restylane Silk or Belotero Balance. A small amount just lateral to the canthus can help if this area has age-related volume loss. 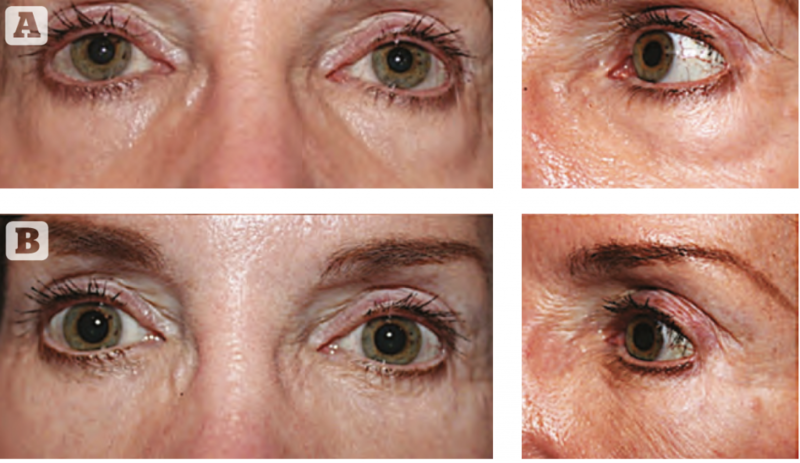 Figure 6 (A) before lower eyelid fat repositioning blepharoplasty. (B) improved, but patient still displeased by the infraorbital hollows. (C) Pleased following placement of Belotero to further smooth the lower eyelid cheek junction. Midface improvement is essential for a beautiful face and to frame the eyes. High G prime fillers (e.g., Juvederm Voluma, Radiesse, Restylane Lyft) are ideal in the midface to enhance the ogee curve. By improving midface support, this can often improve infraorbital hollows/ grooves lessening or avoiding the need to directly fill these areas. It can also optimise an aesthetic cheek contour and lift the nasolabial folds. Midface enhancement can also shorten the lower eyelid to a more youthful look by supporting the lower eyelid-cheek complex. Most of my filler midface lifting and re-volumising is performed with deep preperiosteal depot injections starting at the apex of the zygoma inferolateral to the canthus. I often use a 22 G cannula, but when I do use a needle I find it helpful to inject perpendicular to the skin and vertically directly down to the periosteum and without withdrawing the needle then slowly inject to effect before moving to the next depot site. Massage can be performed for the filler if an unsightly bulge contour develops. Amounts vary significantly from patient to patient, but typically I start with a 1 cc split between the two sides, but sometimes a second 1 cc dose is required. Overfilling and excessively medial placement in the midface is to be avoided to minimise the difference between a dynamic and static appearance and maintain a natural look. Typical amounts needed range from 0.2–0.4 cc in most patients. I prefer the large-sized 22G cannula for this area since there are large vessels including the superficial temporal artery/vein running in proximity to the brow fat pads. It is important to keep the filler deep as contour irregularities can be seen if it is placed too superficially and I only inject into the lateral 30–40% of the brow. A few units of botulinum toxin to the lateral orbicularis muscle enhances the lift effect. To accentuate the brow peak, more filler is placed under the area of the desired peak and then progressively less as you move to the tail of the brow. I advise new eyelid filler patients to expect that 10% of patients will need the HAE to adjust the results from over-fill, swelling, or bluish discolouration. I refer to this as filler ‘sculpting.’ HAF dissolvability varies in the literature but in my experience from lowest (hardest to dissolve) to highest (easiest to dissolve) is: Juvederm Vycross; Juvederm Hylacross Juvederm; CPM Belotero; then NASHA Restylane6–8. With CPM and NASHA, I have seen blue discolouration, oedema, and displeasing over-filled contours improve with even dilute amounts of hyaluronidase (15–30 units/cc). 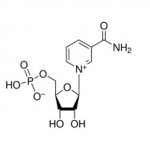 Most commonly I dilute 150 u/cc hyaluronidase for fine filler ‘sculpting’ with preserved saline (0.9% Bacteriostatic Sodium Chloride, Hospira USA) to get 30u/cc and inject very tiny amounts 0.1–0.3 cc subcutaneously and above the orbicularis to see what effect is obtained. I inject just superior to the orbicularis and only mildly compress to avoid deep dispersion and unwanted over-‘sculpting’ or even complete dissolution of the filler. For filler-induced lateral oedema and festoons, I often will inject full strength 150 u/cc hyaluronidase directly within the areas of swelling, but avoid compressing the area as hyaluronidase rapidly spreads through the surrounding tissues and can easily and unintentionally fully dissolve HAF unless this is the patient’s request. It have found it best to repeat every few days to a week with small and dilute amounts of enzyme when filler sculpting to avoid entirely removing the costly filler. The results, outside of the injected fluid effect, can be noticed immediately. 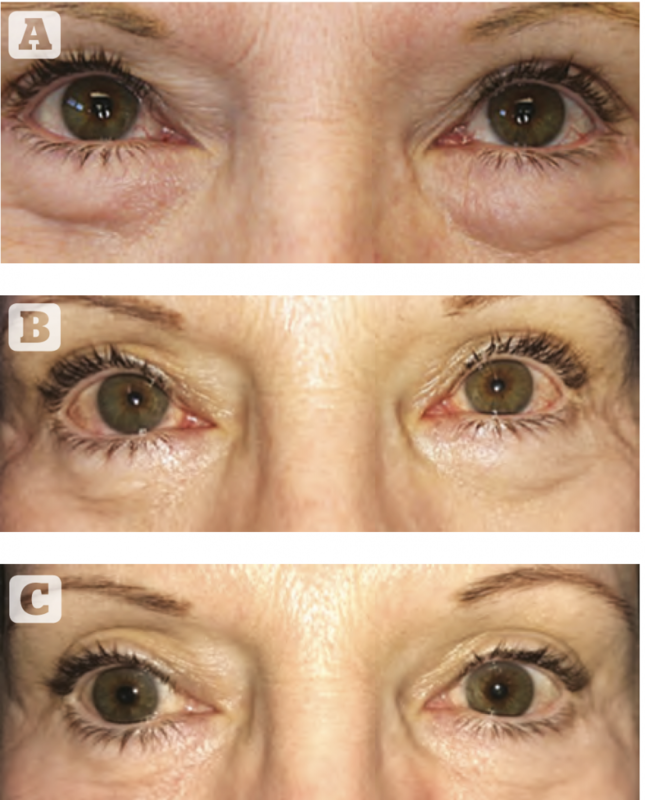 HAF can optimise results when fat transposition to tear trough deformities were inadequate or if over-sculpting caused an aged hollow look following lower eyelid blepharoplasty. Post-traumatic deformities and displeasing contours can be improved with dermal fillers as well. I recommend the use of topical hyaluronic acid serums, and even bundle it with all my filler injections. I have the most experience with the H.A. Intensifier (SkinCeuticals, USA) to help maintain results as it has been shown to boost hyaluronic acid levels by up to 30% and improves the skin thickness and fine wrinkles14. Another important eye cosmeceutical is an antioxidant with tightening properties. I have found AOX Eye serum by SkinCeuticals with its combination of vitamin C, phloretin, and ferulic acid to reduce puffiness, under-eye dark circles, and the fine lines around the eyes. Lastly, a retinol and quality medical-grade moisturiser is key for optimal skin health and thickness, which may further reduce dark under eye circles by improving the thickness of the skin overlying the dark underlying orbicularis muscle. Physical sunblocks should always be used to avoid further environmental and oxidative stress to the thin eyelid tissues. For patients who bruise we offer complimentary intense pulse light treatments, following ocular protection protocols, to hasten resolution. We also provide complimentary cosmetic application of Dermablend (Loreal, USA) and high quality (e.g., Glo, USA) mineral-based makeup. . I have not found post-procedure arnica-based treatments to be needed and their results in published studies bring doubt to their efficacy15. I commonly perform wrinkle blocking neuromodulator injections to the periocular areas simultaneously as they, in my experience, enhance longevity by reducing the mechanical breakdown of the HAF in some of the more dynamic areas of the face. If there is a propensity for eyelid swelling or fat herniation is prominent then I would not advise lower eyelid botulinum injections nasal to the lateral canthus although the crows feet areas provide very nice results while avoiding the aforementioned other issues. 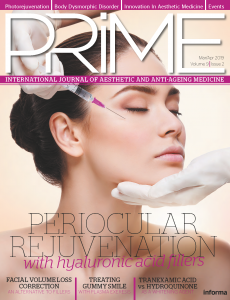 With the continued growth and expansion of differing hyaluronic acid fillers available we are likely to find even better-suited fillers for periocular rejuvenation. Combining HAF with platelet-rich plasma is another area that is being actively looked into to enhance and provide longer lasting results. Newer periocular injectors should carefully study anatomy, and consider external vascular detector devices (e.g., Accuvein) to mark critical areas. Despite a steeper learning curve than needle injections, I strongly advocate large calibre cannula use for all injectors regardless of their experience in the periocular areas. I initially disliked cannulas and now prefer them and only rarely need to fine tune periocular results with a needle. Femieni EM, Hapelas S et al. Surgeons Guide to Facial Soft Tissue Filler Injections: Relevant Anatomy and Safety Considerations. J Oral Maxillofac Surg. 2017;75:2667. Wong CH, Mendelson B.Newer Understanding of Specific Anatomic Targets in the Aging Face as Applied to Injectables: Aging Changes in the Craniofacial Skeleton and Facial Ligaments. Plast Reconstr Surg. 2015 Nov;136(5 Suppl):44S-48S. Rao V, Chi S, Woodward J. Reversing facial filler: interactions between hyaluronidase and commercially available hyaluronic-acid based fillers. J Drugs Dermatol. 2014 Sep;13(9):1053-6. Buhren BA, Schrump H, Bolke E et al. Eur J Med Res. Standardized in vitro analysis of the degradability of hyaluronic acid fillers by hyaluronidase. Eur J Med Res. 2018 Aug 20;23(1):37. Funt D, Pavicic T. Dermal Filler in aesthetics: an overview of adverse events and treatment approaches. Clin Cosmet Investig Dermatol. 2013; 6: 295–316. Allemann IB, Baumann L. Hyaluronic acid gel ( Juvéderm™) preparations in the treatment of facial wrinkles and folds. Clin Interv Aging. 2008 Dec; 3(4): 629–634. Lin DJ, Sami MS, Burroughs JR et al. Ocular injury from local anesthetic injections: needle expulsion–the luer-lok allure. Arch Facial Plast Surg. 2006 Nov-Dec;8(6):436. Raab S, Yatskayer M, Lynch S. Clinical Evaluation of a Multi-Modal Facial Serum That Addresses Hyaluronic Acid Levels in Skin. J Drugs Dermatol. 2017 Sep 1;16(9):884-890.